A hypothesis regarding cholesterol based abiogenesis and its role in the evolution of universe is elucidated. Actinide based primitive organism like archaea have a mevalonate pathway and cholesterol catabolism. The concept of a shadow biosphere of organisms with alternate biochemistry present in earth itself has been postulated by several research groups. This points to cholesterol as the primal prebiotic molecule and evolution of actinidic archaea and viroids from a primitive isoprenoid organism. Metal actinides in beach sands have been postulated to play a role in abiogenesis. Actinide mineral like rutile, monazite and illmenite by surface metabolism would have contributed to abiogenesis. A hypothesis of cholesterol as the primal prebiotic molecule synthesized on actinide surfaces with all other biomolecules arising from it and a self replicating cholesterol lipid organism as the initial life form is presented. The role of actinidic archaea in the genesis of the interstellar polycyclic aromatic hydrocarbons as well as the interstellar magnetic fields important in the evolution of the universe is hypothesized. 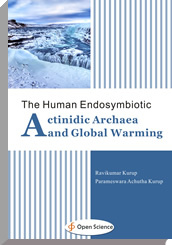 The role of actinidic archaea in global warming and evolutionary cycles is discussed.